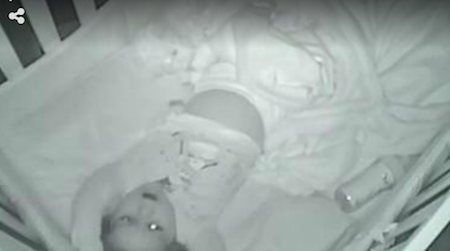 Mom Puts Toddler In Crib, Hours Later She Catches THIS On The Baby Monitor! Mom and dad tucked in their two-year-old daughter for the night, turned on the baby monitor, and quietly shut the door. But shortly after, the couple heard mumbles and sounds coming from the little baby’s monitor. Mom was shocked when she walked over to the baby monitor to take a closer listen. For two whole minutes, baby Sutton laid in her crib and prayed to God – then listed everyone she was praying for. Apparently this evening, the parents had skipped their bedtime prayer ritual so she took it upon herself to make sure she had a few words with God on her own. After posting the video on Facebook, it quickly went viral. Check it out and share with your friends!